The Historic City of Sucre is a well-preserved example of the blending of European and local Latin American tradions and styles. Its typical Spanish-colonial checkerboard street pattern is still intact. Sucre was founded in 1538 by the Spanish, and then named La Plata. It was later renamed after Antonio José de Sucre (Bolivar's right-hand man). It became a cultural center and the seat of the Supreme Court that reigned over large parts of South America. For much of its colonial history, Sucre's temperate climate was prefered by the Spanish royalty and wealthy families involved in silver trade coming from Potosí. As most of the colonial buildings in the city centre are whitewashed, the city also enjoys the nickname of "the white city" or "la ciudad blanca." I arrived in Sucre by plane from La Paz on May 25. Little did I know that it was the yearly departmental holiday. Outside of the airport I even ran into the convoy of Presidente Evo Morales, who had made a quick visit to the Bolivian capital from his seat in La Paz. Two things to remember about Sucre: they like their festivities AND they are very proud to still be the official capital of the country. I stayed for 5 nights in total, mostly to relax a little on a lower altitude than Cuzco and La Paz (where I did not sleep well) and also to visit neighbouring sites Potosi and Cal Orck'o. It's an elegant place, indeed all buildings in the city center are a bright white. Seeing the sights of Sucre itself was as problematic as described in the review below by Iain Jackson. Somehow there always was a reason not to be open: the holiday, or just erratic opening hours. I mostly stumbled upon big locks closing the doors of churches and convents. The most reliable bet is the Casa de La Libertad. Possibly the most interesting place too, as this is where the Bolivians (lead by 2 Venezuelans) declared independence. Entrance is via a guided tour only. Mine was lead by a very serious guide, showing us the treasures that are so important to his country. And to neighbouring countries as well, as it also holds the first Argentinian flag (both Kirchners had been here in recent years to pay their respects). Every day something was happening at the city's central square 25 de Mayo: religious processions carrying a statue around the square several times and accompanied by southamerican marching music (a bit out of tune as well, this is Bolivia), loud protests by indigenous women (wearing very fine traditional costumes, but I guessed that it was not the right moment to take a picture) and even a car rally for most of the weekend. Sucre is one of the prettiest cities in Latin America I have encountered in my travels so far. 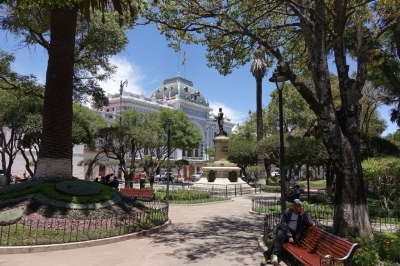 Immediately when I exited the shared cab from Potosi and stepped out at Parque Simon Bolivar, I was smitten by the white colonial and post colonial buildings that make up the city center. Personally, I would put it near the top along sites as illustrious as San Miguel de Allende and Guanajuato. To me it's second only to Mexico City. Sucre at 2.500m was a good comprise between the high, dry and cold mining town of Potosi and the tropical cities of the Bolivian lowlands. It felt a bit like those British cities in the mountains of India where they would escape to in summer with their custom made trains. The wealth present in the city at preivous times shows quite strongly. Overall the city gives up a relaxed vibe and I found my time very enjoyable. I would encourage you to visit the Gutierrez Museum. It shows a little bit the wealth that the upper crust of Bolivian society accumulated in the 19th century, courtesy of the silver mines at Potosi. You should also hike up to La Recoletta for a view of the city. Sucre has an airport connecting to La Paz, Cochabamba and Santa Cruz. The airport is at quite a distance from the city center. Plan 45min or so to get there. A taxi should cost 60 to 80 Bolivianos. To connect directly to Santa Cruz use Amazonas. 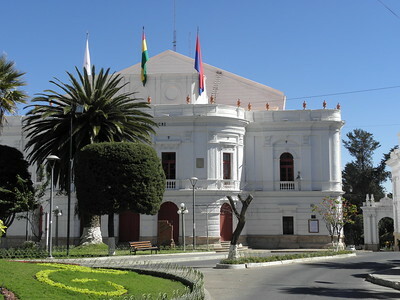 BoA requires a chaotic transfer in Cochabamba. Alternatively, there are plenty of bus and shared taxi options. The bus ride to Santa Cruz seems to be hellish as it takes 14-15h for a seemingly short distance (250km as the bird flies). Apparently, descending 2000m from the Andes comes at a price. The nearest WHS is Potosi which can be easily done on a daytrip. If you don't plan to continue on to Salar de Uyuni (you should, though), it may be advisable to return to Sucre in the afternoon to prevent altitude sickness. You can either take a bus or the faster shared cabs (2.5h, 50 Bolivianos). A bit outside town you find the tentative site of Cal Orck'o . It's still an active concrete factory and they are closed on Monday. Even without entering the museum I managed to get a view of the dinosaur footprints. My recommendation would be to go by cab. I was generous and paid 40 Bolivianos (5€) for a return ride from the city. Picking up on Iain' s and Els' comments it seems Monday is an especially bad day to visit as several sites are closed, most notably the Casa de la Libertad. If you are interested in learning about Sucre (the man) I can thoroughly recommend the Revolutions podcast. There is a whole series of the South American independence movement and Sucre features prominently in it. It's also a great way to pass the time on the long bus rides you are bound to take when travelling in South America. I visited Sucre in March 1993 only 15 months or so after it had been "inscribed" as a WHS. For the preceding 6 weeks or so I had been in low-lying tropical areas and the weather at Sucre's 2790m altitude came as a very pleasant change. I found it an attractive city with many interesting and buildings and a relaxed atmosphere. I was very impressed by the Supreme Court. Not so much the building itself, which dates only from 1945, but by the ease with which I could enter and visit, and this in a country where death squads were said to stalk the land and assassination was the preferred method of settling political differences. On the main square,Plaza 25 de Mayo, are several significant buildings. In the Casa de la Libertad the country's Declaration of Independence was signed and it was treated with appropriate seriousness by the parties of awed schoolkids being shown flags, bloodied clothing and other memorabilia of the struggle for independence. There is a number of interesting churches in the city centre but I found getting into them quite difficult. They all seemed to have different, and very short, opening hours, with eccentric guardians, who may, or may not, open up at the advertised times. Try to penetrate the cathedral to see the Virgin of Guadalupe studded with hundreds of amethysts, emeralds, pearls, rubies etc. It was much venerated by campesinos when I was there. At San Felipe Neri I managed to see the cloisters and climb onto the roof to see the Penitents' Benches, though exactly what these were for I did not discover. The museum in Santa Clara convent is also worth a visit for its eclectic mix of exhibits. There are plenty of places to stay (I can recommend Hostal San Francisco) and to eat (eg La Taverne in the Alliance Francaise) and I was left almost entirely hassle free. Declarations of Independence: At the "Casa de la Libertad" the Declaration of Independence of Bolivia was signed on August 6th, 1825.